Folktroll metallers MethysOs from Limassol, Cyprus have announced the release date of their debut full-length album “Folkloria“, presenting the official video trailer that you can watch below. The band has also revealed the album tracklist and the cover artwork, made by Konstantinos Skenteridis Art. 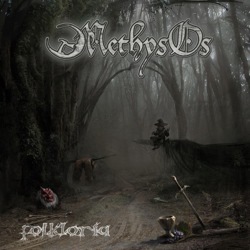 “Folkloria” will be self-released in CD edition on March 12th, 2016, exactly four years after the band’s demo “Beyond Myths and Legends“, MethysOs’ only work up to date. Mark the day where trolls, kalikantzaroi, namahages and weary travelers shall all come together to celebrate the creation of their spiritual child!